Digital mobility and decision-support tools are creating in-house opportunities for financial advisors of varying backgrounds and expertise. Boston, May 11, 2017 – Robo-advisor platforms offer retail investors low-cost access to professional investment management, a convenient self-service user interface, and, if desired, centralization of assets. The expectation is that these platforms will grow and develop in line with various client-segment requirements, but robo-advisory platforms are still climbing a public-awareness curve, and account volume and size are not yet generating abundant wealth for the platforms. Can retail robo-advisor platforms offer a significant benefit to the target market and work their way to profitability? 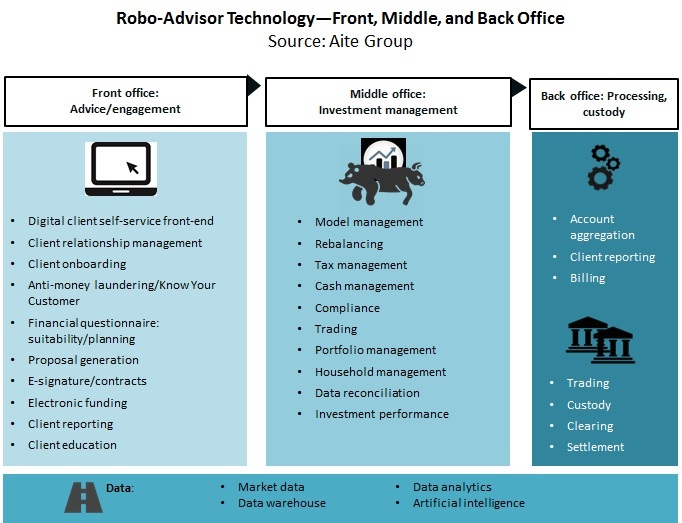 Based on early 2017 Aite Group phone interviews with U.K. and U.S. financial institution executives, retail robo-advisor platforms, and business-to-business robo-advisory technology vendors, this research looks at the robo-advisor platform’s developing use and its potential evolution of the investment offering as well as the spectrum of technology supporting the effort. This 23-page Impact Note contains two figures and two tables. Clients of Aite Group’s Wealth Management service can download this report, the corresponding charts, and the Executive Impact Deck. This report mentions Advisor Software, AdvisorEngine, Apex Clearing, Atom Bank, Barclays, Blaze Portfolio Systems, BondIT, Cofunds, Envestnet, Fidelity, Fiserv, Hedgeable, InvestCloud, Marstone, Merrill Lynch, MoneyGuidePro, MyVest, Oranj, Pershing, RobustWealth, Royal Bank of Canada, Salesforce.com, Saxo Bank, Schwab, SEI, State Street, Tandem, TD Ameritrade, TIAA, Trade Warrior, Trizic, UBS, Wealthfront, Wealthify, and Winterflood Securities.